Unique hand powered launcher sends planes soaring up to 30 feet. Adjustable wing flaps for incredible aerodynamic stunts. Perfect for indoor and outdoor flight. 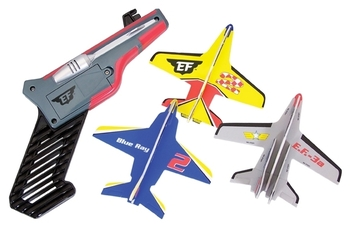 Set includes launcher and three planes. No batteries required. Ages 5 and up.